Hares are continuing to suffer and die in Ireland's cruel hare coursing - as revealed in a new Irish Council Against Blood Sports report. 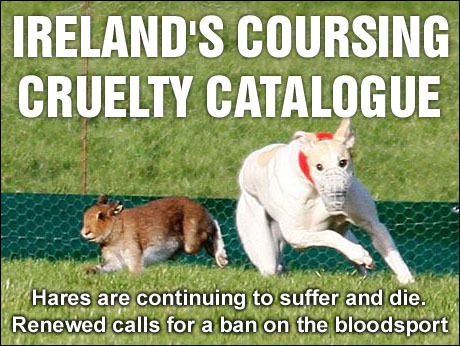 Our "Coursing Cruelty Catalogue" report focuses on documents relating to the 2014-15 coursing season and reveals sickening instances of cruelty. Some hares were killed outright by the greyhounds while others later died of their injuries. [Please scroll down for full details]. - At a meeting in Thurles, a hare was suffering a "large injury to the shoulder and front of one of the legs". - At Borrisoleigh, hares died in the paddock before the meeting started and four more died during the meeting. - At the Doon and District meeting, hares were not in good condition with many having sores on their feet. - At Nenagh, among the captured hares were two young hares and two heavily pregnant hares. - At Mallow, three hares were struck by greyhounds, one of which was mauled and had to be carried off the field. Obtained under Freedom of Information, the documents also show the usual breaches of licence conditions, as reported by National Parks officials who attended just 17 out of the 75 plus events held all over the country. Also exposed is the under-reporting of hare injuries and deaths. For example, at Galway and Oranmore, over the three days of coursing, the coursers stated that 6 hares “required assistance” (meaning dogs hit/mauled hare), while the ranger who monitored two days of coursing noted 11 hares struck by dogs (6 hits, 5 pins). At Borrisoleigh, a NPWS ranger stated that 6 hares were struck, with 4 dying of injuries, while coursers said that 5 hares “required assistance”. At East Donegal, the ranger noted that 3 hares were hit by dogs and 2 hares were dead in enclosure the following day. In contrast, the coursers cited zero hares “requiring assistance” and two hares dead from so-called natural causes. The coursing club's vet recorded no hare deaths and no post mortems. Then there were the licence breaches at coursing meetings attended by National Parks rangers. At the North Kilkenny meeting, a ranger noted that hares were coursed more than once. He also noted that there was no veterinary involvement on the first day of coursing. Regarding Doon & District, a NPWS official stated that the “club appeared to be in breach of Section 44 of the netting licence, as they could not produce details on their members who were certified to catch hares on their behalf”. He added that Doon released 3 hares without consulting the ranger – another breach of Section 34. The official commented that the club’s husbandry of the hares was lacking in terms of food and shelter and that “some of the hares were not in good condition...many had sores on their feet”. At the meeting of Mallow coursing club (which the Minister, in her infinite wisdom, decided not to sanction for licence breaches in 2013/14), hares were run down from the escape area - where coursed hares are kept. This is a sign that hares may have been re-coursed on the same day. To the question, "were hares coursed more than once on any day", the ranger did not tick either yes or no, signalling that the ranger was unsure as to whether hares were re-coursed. The ranger noted that the escape area was not fully divided, meaning that non-coursed hares were able to mingle with coursed hares. At Thurles, contrary to a conservation ranger’s request, hares were brought from the escape area at the interval. The club told the ranger that three hares had been boxed but it became apparent later that seven were boxed. In an email to NPWS HQ, an official for the mid-south region noted: “This appears to be a breach of Section 34” of the licence. If coursers are prepared to under-report hare injuries and kills and to breach licence conditions under the noses of monitoring NPWS officials, it is more than likely that this is also occurring at meetings which are not being monitored. As one National Parks official pointed out in an internal memo, "nearly all hare coursing conditions" are "very difficult to really attempt to enforce". And the coursers know this. Every year, a sham exercise is played out by the National Parks HQ, who write to the Irish Coursing Club, raising licence breaches by their affiliated clubs. We suspect the coursers are thumbing their noses and literally laughing at the National Parks & Wildlife Service, because they know that no action will be taken, leaving them free to do as they please. The Irish Council Against Blood Sports is renewing its call on Minister Heather Humphreys to stop licensing this cruel bloodsport. Coursers state that 4 hares "required assistance" and 4 were examined by vet, with 1 being treated by vet. Coursers claim that 2 hares escaped. Meanwhile, the NPWS ranger in a memo to NPWS HQ, regarding an injured hare, stated: "I did not notice the hare on the Saturday. I don't take the hares out of the boxes but check their status by looking at them and feeling their backs. If I notice something unusual, I take it out or ask the club to take it out. What caught my attention on the Sunday was the smell coming out of the box. When I took the hare out, I noticed a large injury to the shoulder and front of one of the legs. I asked the attending vet to check the hare. He said it wasn't too bad, would give it some antibiotics. I did ask should it be put down right there but he disagreed. He later approached me in the day and said that he had given the hare a long acting antibiotic (3 days) and a steroid for pain and that the injury appeared worse than he initially thought. He said to bring the animal to a vet in 3 days. I did that and the vet I brought it to recommended it be put down." NPWS officials cited other problems at this meeting, including a suspicion that hares were coursed twice in one day, a breach of the licence conditions, and also that not all hares were released in daylight, another breach. In an internal email from a National Parks official, it was stated that "F---- (figure blanked out) died in the paddock before the meeting and four more hares died in the paddock between day one and two, but no post mortem carried out." The Borrisoleigh coursers stated that 5 hares "required assistance" and 5 were examined by vet, with 3 dying, but no post mortem carried out by vet. Coursers had 71 hares at start of meeting and released 64, stating that 4 hares had escaped. Meanwhile, the conservation ranger stated that Borrisoleigh had 6 hares hit by dogs on day 1, with 4 dying overnight, most likely from the injuries they received the previous day. The ranger also stated that she had a problem with the muzzling, stating: "there may be a problem with the current muzzles they are using." Coursers stated that 9 hares "required assistance" with 1 being euthanised by vet and 4 died, 3 in pen and 1 in a box. No post mortem carried out on any of these hares by vet. Coursers state that 8 hares "required assistance" and 3 were euthanised by vet as a result of their injuries. Coursers state 3 hares "required assistance" and 3 died and 2 "escaped". Vet report cites nil hares treated for injuries and does not refer to 3 hare deaths or post mortem. Coursers state 1 hare "required assistance" 1 examined by vet and 1 euthanised by vet. No post mortem. Coursers state 3 hares "required assistance" and 3 examined by vet. 1 hare noted to have died between 9 and 11 November, but no post mortem carried out. Coursers state 5 hares "required assistance", 5 examined by vet and 1 died of "natural causes". Vet makes no reference to this hare death and no post mortem carried out. Coursers state 3 hares "required assistance" and 3 examined by vet. Coursers also state that 1 hare died after it "hit post while being reboxed for release". No post mortem carried out on this hare. Ranger stated that 2 hares were hit by dogs and noted on his report that "2 hares dead in the enclosure on day no. 2. May have died from injuries on day 1." Coursers did not record any hares struck and claimed 2 hares died of "natural causes". Vet recorded no hares treated and no deaths. No post mortems carried out on dead hares. Coursers state that 2 hares "required assistance" and 2 examined by vet, who noted that he treated 12 hares with antibiotics, but offered no explanation as to why the hares needed this treatment. Coursers claim that 2 hares "escaped on 2 day during coursing and one after being boxed". (How could it escape from box?). Meanwhile, NPWS official, Stefan Jones, stated in an email to NPWS HQ that Doon coursing club appeared to be in breach of Section 34 of the netting licence as they could not produce details on their members who were certified to catch hares on their behalf. Also, according to the NPWS official, Doon released 3 hares without consulting the ranger - another breach of Section 34. NPWS official also commented on the husbandry of hares as follows: "Issues include the provision of sheaf oats, more sallys and shelters and better foot baths. Some of the hares were not in good condition or fit to course, according to vet. Many had sores on their feet." NPWS ranger stated 6 hares struck by greyhounds, 1 injured and 1 put down because of injuries. Coursers state 6 hares "required assistance" and 1 died. Vet did not refer to any dead hare nor was a post mortem carried out. NPWS ranger stated 6 hares hit by dogs on day 1 (3 hits and 3 pins), 1 hare put down because of injuries on day 2, according to vet, and on day 3, NPWS recorded 5 hits (3 hits, 2 pins). Meanwhile coursers stated that 6 hares "required assistance" over the 3 days of coursing, in contrast to the 11 noted by ranger for 2 days of coursing attended. NPWS ranger noted that there was heavy rain all night on the night of the 5th and all day on the 6th and that the area in front of the escape became very poached as the day progressed, and that it was evident that towards the last few courses the hares were reluctant to run through the poached up mud. Coursers state that 3 hares "required assistance", 1 treated by vet and 1 put down by vet because of injuries. Coursers state that 2 hares "required assistance" and 1 died. This hare was described as "killed" by vet. NPWS ranger stated that 3 hares were struck, "1 of which mauled and had to be carried off) on day 1, and 1 hare hit on day 2. Ranger noted that hares were run down during lunch from escape to boxing area, a sign that hares may have been recoursed on same day. Coursers in contrast stated that just 1 hare "required assistance" over the 2 days. NPWS ranger stated that 4 hares pinned over the 2 days, with 1 hare injured and 1 put down because of injuries. Meanwhile coursers stated that 4 hares "required assistance" with 1 being euthanised by vet. NPWS ranger reported 4 hares hit by dogs. Ranger also noted that on visiting the grounds on 8 November, there were 2 young hares and 2 heavily pregnant hares. Ranger stated that coursers expressed concerns that given the wet ground, hares might not run as well as they could. Coursers stated that 3 hares "required assistance". NPWS report records 12 hares hit by dogs, 75 hares at start of meeting "+ 1 dead". Meanwhile coursers report 3 hares "requiring assistance" and vet's report stated that 2 hares were "unfit for coursing" 1 injured and 1 "sick or otherwise unfit" after coursing. No reference to treatment of hares, and no post mortem on dead hare referred to by NPWS ranger. Ranger report cited 6 hares injured by dogs, while coursers cite 5 hares "requiring assistance" and "examined by vet". Discrepancy in number of injuries. To the question "were hares coursed more than once on any day", the ranger ticked Yes. He also ticked that there was no veterinary involvement, with vet on call only on day 1. Ranger also noted that 1 hare was "in season" on both days of meeting. He noted that there were 74 hares available on day 1 of the meeting, but 79 courses run, so hares must have been recoursed as ranger ticked on day 1, a certain breach of the licence. However, the coursers stated that just 64 coursers were run on day 1 and 48 on day 2, as opposed to the ranger with 79 on day 1 and 59 on day 2. Get in touch with all your local TDs now and urge them to back a ban on hare coursing, hare hunting and hare shooting. Urge Minister Heather Humphreys to show compassion for the persecuted Irish Hare and end the hunting, coursing and shooting of the species. The Irish Hare is under severe pressure from hunters, shooters and coursers. Under licence from your Department, the creatures may be netted from the wild during seven months of the year for use as live bait for dogs in coursing. During six months of the year, your Department allows hares to be blasted to death by shooters who take pleasure in destroying our wildlife heritage. Hares urgently need protection. I urge you to act to give permanent, year-round protection to this species.